Vestil Pallet Truck — 6,000 lbs. The Vestil 6000 lb. Pallet Jack has a large, ergonomic cushion-grip handle with fingertip controls and large steering wheels for easy handling. 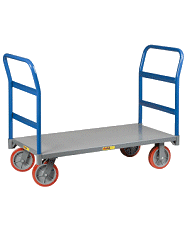 Increase productivity by reducing the stress and strain of manually lifting loads. Warehouse and moving professionals have come to rely on Vestil to deliver premium-quality construction and long-lasting performance. Lifts load from 2 7/8" to 7 3/4". 200 degree turning radius for greater maneuverability. The Vestil 6000 lb. Pallet Jack easily handles loads up to 3 tons.